Pssst…let me tell you a secret. The magic is in the windows. To create a high-impact room, every designer knows custom drapery sets the bar for fabulous and functional design. Over the years and in our travels, we’ve seen some naked windows. (It’s not a good look unless you have a panoramic view of the ocean.) We know the process of selecting window treatments can be taxing. When clients ask us how they can create high impact window treatments while keeping their budget intact, we offer these three guidelines. One size doesn’t fit all for drapery. For a living room, you may want more privacy. For a bedroom, perhaps you want less sunlight streaming in the morning. Who doesn’t want to sleep in a bit longer? 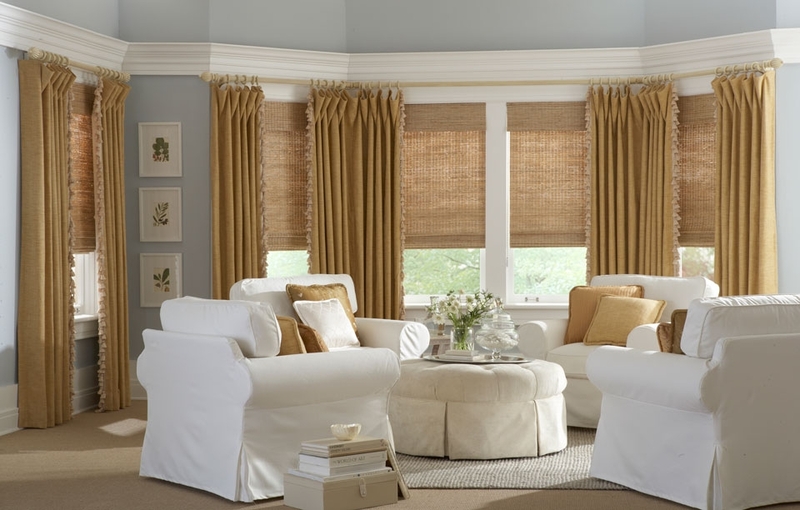 Semi-opaque Roman shades offer that much-desired coverage. In rooms where privacy isn’t a key factor, we’ve layered a valance atop of a set of sheer curtains to create interest.Maybe you don’t like a window’s placement. How do you eliminate the negative or accentuate the positive in a room? Just add drapes. Like a great pair of Ray-Bans or a perfectly tied silk scarf, a custom window treatment can conceal a flaw and convey an at-ease style. Did you know that fabric can emote? Just as paint color can set a mood, so can a window treatment—all from patterns to textures.Let’s say you want drama. Stay with me for a second. We’re not talking reality TV drama here. We’re talking the WOW factor. You can have it in a Dupioni silk panel, a balloon shade or an ornate tassel. Perhaps your preference is a sanctuary of peace. Then we would recommend a tufted fabric, one with soft, billowy folds. For one family we designed a homework room where the window treatment of choice, the Roman shade, framed the space. To evoke some playfulness, we picked a rich fabric reminiscent of a crayon box for the shade which we combined with high board and batten wainscoting, navy blue walls and a custom made salvaged wood table. Why Roman? For a space designed specifically for children, it’s best to skip long panels, plus the cordless aspect makes it safer for little hands (our client-parents agreed). We love the soft folds when it’s closed and the panel coverage it provides when lowered. The outcome: Inspired warm design conducive to better study habits, high marks from the kids and happy parents. So how do you want the room to feel: Opulent? Casual? Feminine? Masculine? The good news is there’s a myriad of options in the marketplace – from valances to cornices to shutters to swags. The great news is we’re here to narrow down the options for you. Layering window treatments with decorative accessories instantly transforms the space from fail to fabulous.In one client’s home, they mentioned the living room felt hard. First we divided the large bank of windows into three with pale-colored roman shades to welcome light and maintain privacy when desired. Then we anchored a set of gorgeous box-pleated panels on each end. Finally, to give the room visual height, we installed a cornice (yes, we do that as well) six inches above the window frame and covered it in the same fabric as the curtain panels. This nod to traditional design and layering technique softened the architecture and earned us rave reviews from our clients. So let’s recap: consider the function, think about your feelings and add fabulous. Are you ready to talk about how Grace Thomas Designs can give you fabulous and functional design when it comes to your windows? Contact us to set an appointment today.